Dr. Lovett's newly revised and updated book, DEALING WITH THE DEVIL, is now available for purchase on Amazon.com. Click HERE for more information. In 1951 Dr. C.S. 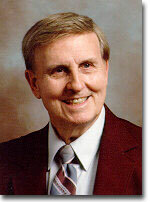 Lovett founded PERSONAL CHRISTIANITY for the sole purpose of helping believers get ready to meet Jesus when He returns. Not many are ready for the questions the Lord will ask of them in that day. Every book is designed to help you stand before Him without fear or embarrassment. Dr. Lovett’s career consisted of businessman, Lt. Colonel in the Air Force, Air Force Chaplin, pastor/founder of Personal Christianity, an editor of the Amplified New Testament, and writer of 45 books and many more articles. It was Dr. Lovett’s desire that Personal Christianity should not be aligned with any denomination. He taught the Word of God as the Holy Spirit revealed it to him. As a result, the ministry has not been inhibited by preconceived ideas that separate denominations. On November 18, 2012, Dr. Lovett “graduated to glory.” In accordance with Dr. Lovett’s wishes, Personal Christianity is dedicated to continuing his legacy of “preparing for His appearing” and will be providing books and other writings in continuance of his ministry.